The Browne Foodservice 13" line serving spoon is constructed of stainless steel that is easy to clean and will resist corrosion. 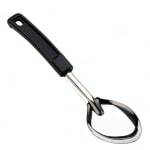 The 13 inch length and black plastic handle allows you to reach across hot bars, into deep containers, and get better leverage over heavier food items. The grooved handle of this line serving spoon makes it easy to handle and store this utensil. Keep only the highest quality line serving spoons in your kitchen with this item.